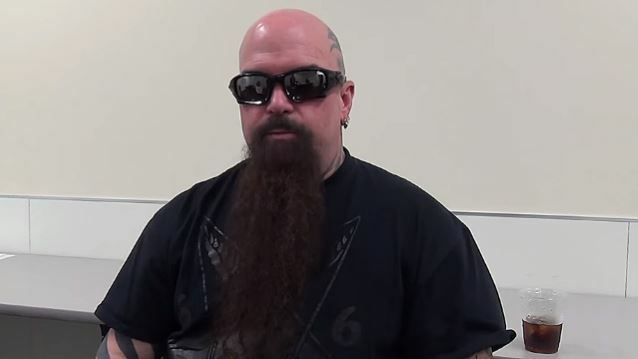 Kerry King says that he is "completely open" to the idea of Gary Holt contributing song ideas to the next SLAYER album. Holt, who is still a member of San Francisco Bay Area thrash icons EXODUS, has been the touring guitarist for SLAYER since January 2011 when the band's co-founding guitarist, Jeff Hanneman, contracted necrotizing fasciitis, also known as flesh-eating disease, from a spider bite in his backyard. The infection ravaged the flesh and tissues of Hanneman's arm, leading to numerous surgeries, skin grafts and intense periods of rehab that forced him into semi-retirement and left him near death at several points. Holt did not contribute to the songwriting process on SLAYER's last album, 2015's "Repentless", although he did lay down guitar solos on most of the record's twelve tracks. In an interview with HATEBREED frontman Jamey Jasta's podcast, "The Jasta Show", King was asked if he would be willing to have some of Holt's ideas on the next SLAYER effort. He said (hear audio below): "I'm entirely open to having Gary work on something. I know he's gotta work on an EXODUS record and I've got tons already for this one. But, you know, if he's gonna stick around… I didn't want it on the last one, and I knew that. I'm completely open to having that conversation. I haven't talked to Tom [Araya, bass/vocals] about it, I haven't talked to Gary open about it, but I'm open. That's not saying it is or isn't gonna happen. But my ears are open." King added that there's no shortage of ideas for the next SLAYER LP, despite the fact that "Repentless" came out only thirteen months ago. "Nuclear Blast [SLAYER's current record label] is new to us, and we're new to them, and they're already bugging me for new material, and that was before my record was a year old," Kerry said. "And I'm, like, 'Dude, it's not even a year old.' [Laughs] I've got all this extra material, and yes, I've got more ideas; there's probably eleven [or] twelve [song] ideas sitting around now. So there's not a lot of work that's gonna have to go into it, but it's just… We haven't been to Australia, we haven't been to South America, we haven't done a Pacific Rim [tour]. There's a lot of places we haven't even been yet [on this tour cycle]. And to mix up recording and playing live, it just takes something away from each of 'em." Hanneman eventually died in May 2013 from alcohol-related cirrhosis of the liver. He is credited for writing many of SLAYER's classic songs, including "Angel Of Death" and "South Of Heaven". Holt told In The Loop magazine earlier in the year that he would be ready to contribute song ideas to SLAYER's next album, if he is asked to do so. He said: "I've certainly never been one to have a shortage of material, so yeah, it's a bit premature, but down the line, if Kerry and Tom want me to, I have about as good of an insight into SLAYER's writing style by now as just about anybody. I think I could write some things that fit right in, sure. But right now, of course, we're focused on the tour [in support of 'Repentless']." Regarding why Gary wasn't invited to pitch in during the "Repentless" songwriting process, King explained to LA Weekly: "I would have loved for Gary to have been more involved with writing. I thought a long time about this, but I didn't think SLAYER fans were ready for that yet. Even though Gary's a household name in thrash, I didn't feel that the first SLAYER record without Jeff should have Gary Holt contributing as a writer." Hanneman's last appearance with SLAYER was in April 2011, when he played an encore with the band at the "Big Four" concert in Indio, California.